What Are The Negative Health Effects Of Sodium Nitrate? Sodium nitrate (NaNO3) is a versatile chemical compound with wide applications that is mined from the earth as saltpeter. The health concerns mainly arise from it being used as a food additive (mostly in processed foods and cured meats as a preservative) and to a lesser extent as a fertilizer. Sodium nitrate (NaNO3) is a versatile chemical compound with wide applications that is mined from the earth as saltpeter. Sodium nitrate is used in fertilizers, food preservatives, for wastewater treatment, and even in rocket fuel. The health concerns mainly arise from it being used as a food additive (mostly in processed foods and cured meats as a preservative) and to a lesser extent as a fertilizer. Since sodium nitrate is readily water-soluble, drinking contaminated water may expose one to this naturally-occurring substance. Sodium nitrate combines to form nitrosamines that can severely affect the human DNA. Cured meat and salted meat containing food additives have been linked to cancers of the stomach and esophagus due to the presence of nitrosamines. 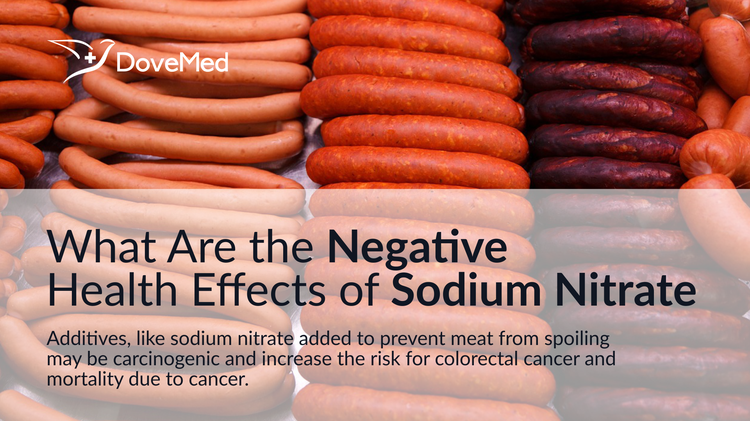 The World Cancer Research Fund (WCRF) highlight in their research that foods with nitrates in high concentration, such as processed meats, can elevate the risk for colon cancer. Processed meat, such as sausage, bacon, hot dogs, and ham, contain added preservatives and salts. In fact, a study by the Harvard School of Public Health in 2010 stated that processed meats contained 4 times more sodium and 1.5 times more nitrate preservatives than unprocessed meats. According to the same study, this increases the risk for heart disease by 42% and for type 2 diabetes by 19%. The additives, like sodium nitrate, are added to prevent meat from spoiling and to preserve their ‘rich red’ color. However, it is these very same chemicals that combine to form carcinogens and increase the risk for colorectal cancer and mortality due to cancer. Mayo Clinic informs that the presence of nitrates may interfere with the body’s utilization of sugar, leading to the development of diabetes. Sodium nitrate may cause hard arterial walls and narrow arteries, resulting in atherosclerosis and cardiovascular disease. According to the US Environmental Protection Agency, babies and infants exposed to above permissible nitrate levels are prone to blue baby syndrome, a severe health condition that causes bluish coloration of the blood due to high nitrate concentrations. This can occur when the children are fed formula-based foods prepared using contaminated drinking water. Ingestion nitrates in water by pregnant women may cause growth retardation of the fetus, defects of the heart and nervous system, and elevated incidence of sudden infant death syndrome. The International Agency for Research on Cancer (part of WHO) has placed nitrates high on the list of potential carcinogens that need further research to assess their health implications. A study published in 2009 in the Journal of Alzheimer’s Disease showed that there could be an association of neurological conditions, like Parkinson’s disease and Alzheimer’s disease, and diabetes mellitus with increased and chronic consumption of nitrates, probably due to certain mutations that damage the DNA. They recommended that the use of nitrates to preserve food be avoided, their use in fertilizers be decreased, and specific measures be identified to detoxify food and water before consumption. De La Monte, SM; Neusner, A; Chu, J; Lawton, M (2009). "Epidemiological trends strongly suggest exposures as etiologic agents in the pathogenesis of sporadic Alzheimer's disease, diabetes mellitus, and non-alcoholic steatohepatitis". Journal of Alzheimer's disease: JAD 17 (3): 519–29. doi:10.3233/JAD-2009-1070 (inactive 2014-03-22). Preston-Martin, S., et al. 1996. "Maternal consumption of cured meats and vitamins in relation to pediatric brain tumors." Cancer Epidemiol.Biomarkers Prev. 5(8):599-605. Honikel, K. O. (2008). The use and control of nitrate and nitrite for the processing of meat products. Meat science, 78(1), 68-76. Desmond, E. (2006). Reducing salt: A challenge for the meat industry. Meat science, 74(1), 188-196. Sindelar, J. J., & Milkowski, A. L. (2011). Sodium nitrite in processed meat and poultry meats: a review of curing and examining the risk/benefit of its use. American Meat Science Association White Paper Series, 3, 1-14.